Even the keenest crime fans could be forgiven for not being familiar with The Pressure Gauge Murder, or with its author, who rejoiced in the name of F.W.B. Von Linsingen. Plenty of writers with a name like that might have considered a pseudonym that rolled off the tongue a bit more easily. But not F.W.B. However, it has to be admitted that he never published another crime novel. I had never heard of the book myself, until I came across mention of it in Steve Lewis’s terrific blog. He highlighted its great claim to fame – a marvellous map - and I’ve borrowed the image. I picked up my copy at the Harrogate book fair last Saturday. It’s a novel set in South Africa – the opening scene is set in The Black Diamond Hotel, ‘a drinking salon of repute among the Lichtenburg diggers’. 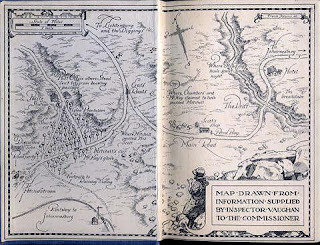 I’m not yet sure what I’ll make of the mystery, but a book with a map like that can’t be too bad! On a visit to the city eighteen months ago, I read The Oxford Murders by Guillermo Martinez – even writers from Argentina, it seems, love to use the city as a crime scene - and very much enjoyed it. It’s a literary detective story of considerable appeal. Now I’ve seen the film, which boasts an excellent cast including Elijah Wood as the student (named Martin) at the heart of the story, John Hurt as a mathematician with a philosophical bent who is his hero, Anna Massey as his landlady (and the first murder victim) and Leonor Watling and Julie Cox as the women who fall, more at less at first sight, for lucky old Martin. Jim Carter plays the investigating cop with his usual gusto. I had mixed feelings about the film. It’s a very difficult book to adapt for the big screen, I think, and although the movie is at times visually stunning, the script is verbose and I wasn’t entirely convinced by some of the acting, which struck me as being at times over-the-top. Worth watching, yes, but a good example of material that suits prose better than a theatrical experience. I’m really pleased to have been invited to Oxford, to speak at the St Hilda’s College Crime and Mystery week-end in August. This is an event which I’ve attended two or three times before, although not for a few years. St Hilda's was, until recently, a college exclusively for female students. Val McDermid is an alumna, and in fact she and I were contemporaries at the university, though our paths did not cross until many years later. My previous visits to the St Hilda's week-end have been pretty memorable – I met Anne Perry and Susanna Gregory here for the first time, for instance, and remember a hugely enjoyable visit to an Inspector Morse exhibition with the likes of Colin Dexter and Andrew Taylor, as well as a delightful lunch with a retired tutor from my old college. The two principal organisers are Kate Charles, a former chairman of the CWA and a much under-rated writer, and Eileen Roberts, who spent a good many years at St Hilda’s and retains her connection with the event, which is especially popular with American crime fans, as well as members of Mystery Women. It was at St Hilda’s that I was encouraged by those great crime enthusiasts Lizzie Hayes and Ayo Onatade to follow Andrew Taylor’s lead and become an honorary Mystery Woman. Which I remain to this day! The topic for the week-end (at which the speakers deliver papers with a unifying theme) is ‘the wages of sin’, and in due course I’ll have to think about an interesting way of addressing the subject. Any suggestions of an angle that readers of this blog would find appealing will be gladly received! A couple of days ago, for instance, and completely out of the blue, I received a call from a lady called Sarina Stapledon. She’d been told by a friend that Waterloo Sunset featured, in passing, the legendary science fiction writer, Olaf Stapledon. And it turns out that Sarina is the late Olaf’s daughter in law. She and her husband have invited me to visit them for a chat about Olaf, and I’m looking forward to filling the many gaps in my knowledge about a writer of distinction who just happened to have a day job working for a shipping company in the heart of Liverpool. I was also contacted by a writer called Frank Burton, whose website features promotes his own work. I haven’t had a chance as yet to read the novella he told me about, and which is available via his website, but his email communicated great enthusiasm for writing, so I’m looking forward to it. Blogs provide wonderful opportunities for mid-list writers like me to get some review coverage at a time when the review space in print newspapers seems constantly to diminish. From the comments on this blog, and the information contained in others mentioned in the blogroll, I derive a great deal of enjoyment, as well as intriguing snippets of information. Naturally, I’m glad when people say nice things about this blog and a couple of jolly good writers based in the US and whom I’ve never met have this week given awards to ‘Do you write under your own name?’ Julia Buckley kindly gave me a ‘Blog Sisterhood Award’ (actually, I’m also a member of Mystery Women, which continues to baffle Mrs Edwards) for a blog with ‘great attitude’. Eric Mayer generously bestowed a Premio Dardos ("prize darts" in Italian) award for recognition of cultural, ethical, literary and personal values in the form of creative and original writing. Much appreciated. However, I’m going to wimp out of nominating 25 other blogs for these awards, and I’ll content myself with saying that the blogs in the blogroll offer a great deal of info and entertainment to me, and I’m sure you’ll find plenty in them to appeal to you too. The Scoop, my latest entry to Patti Abbott's series of forgotten books, was the second collaborative writing project undertaken by members of the Detection Club. It was originally written for broadcast on BBC radio, first appearing in ‘The Listener’ in 1931. Not until 1983 did the story appear in book form, when Gollancz published it, together with Behind the Screen, a similar effort from 1930. Essentially, The Scoop is a novella, and has the strengths and limitations of these round-robin efforts. One great strength is the quality of the writing. In Golden Age detection terms, the authors really were the cream of the crop: Agatha Christie, Freeman Wills Crofts, E.C. Bentley and Anthony Berkeley among them. Dorothy L. Sayers kicked off the story and also finished it, and everyone else also wrote two chapters each. The only author whose other work I haven’t read is Clemence Dane. Dane was a pseudonym for Winifred Ashton. In her time, she was very well known in the world of theatre, but her reputation in the crime field has not survived too well (her three detective novels were co-written with Helen Simpson.) However, it seems that she was a successful playwright and even won an Oscar. Not many crime writers can make a similar claim. The story centres around a newspaper, ‘The Morning Star’ (very different from the left wing publication of the same name, which continues to flourish to this day.) The main focus of interest for the newshounds is the Lone Bungalow Mystery – a woman has been found stabbed to death in mysterious circumstances, and a young reporter called Johnson is sent to investigate. He soon discovers the weapon, but is himself murdered, and a more experienced reporter, Denis Oliver, takes over the investigation. The authors’ distinctive styles contribute to the fun. Sayers writes with her usual gusto. Christie is clear, witty and readable. When Crofts takes over, he switches attention from the amateur detective work to the plodding investigation of Scotland Yard. When Clemence Dane concentrated on the purchase of a puppy by one of the secretaries who works on the newspaper, I began to understand why her career as a crime writer was not exactly legendary – but in the end, the puppy contributes to the sorting-out of the story. This story was a novelty when it was written. More than three-quarters of a century later, I still found it a highly engaging curiosity. Stage Fright is a Hitchcock film of 1950, boasting a mixed and noteworthy bag of ingredients. A young man who has become embroiled in the murder of his actress lover’s husband flees from the police and seeks help from a much more dependable woman, Eve Gill. It’s a neat and suspenseful situation which results in a watchable movie. There are, however, two flaws. First, the story sags in the middle – a shortage of meaningful plot, I felt, although the ending is strong. Second, the flashback which opens the film turns out to be a bit of a cheat. The cast is impressive, and makes the very best of the material. Marlene Dietrich is suitably sultry and malevolent as the scheming actress, and sings a Cole Porter song during that rather laboured middle section of the film. Richard Todd, a heartthrob in his day, is her neurotic and unreliable stooge. Eve Gill is played by Jane Wyman, whose greatest claim to fame is that she was President Reagan’s first wife. He was her third husband. Jane, a pretty woman, was obviously quite a character; she later married yet again, divorcing only to re-marry the chap before divorcing again, finally abandoning marriage, no doubt exhausted, and turning to religion. Eve’s father was played by Alastair Sim, and there were minor parts for Miles Malleson, omnipresent in films of that period, and Ballard Berkeley, who is now remembered by many as the Major in ‘Fawlty Towers’. The story comes from a novel called Man Running, one of six books featuring Eve Gill and written by Selwyn Jepson. His reputation has not survived the passage of time too well, but he was prolific as a novelist and screenwriter, and came from a literary family. His father, Edgar Jepson, was an early member of the Detection Club, and co-author of a legendary detective story, ‘The Tea Leaf’. And Selwyn’s niece is the notable author Fay Weldon. I’ve subscribed to Crippen and Landru’s books for several years. I’m especially a fan of their ‘lost classics’, and the latest to appear is The Minerva Club, by Victor Canning, edited by John Higgins. As John Higgins says, Canning (1911-1986) ‘has fallen out of fashion and largely out of print but was in his heyday a hugely versatile and successful writer’. Among many other achievements, he wrote the book which Hitchcock turned into that enjoyable movie Family Plot. When I was young, my father (a fan of the thriller, more than the classic whodunit) read a number of Canning’s novels, but I never really got into them, and I wasn’t aware of him as a writer of short stories at all. This collection gathers three distinct series of stories. The Minerva Club is comprised of criminals, and the Department of Patterns is a French police agency. There are also a dozen stories featuring ‘Dr Kong’. This looks like another excellent set of ‘finds’ and I’ve already starting dipping into it. The same publishers have also just produced A Little Intelligence, short mysteries by two writers better known for their sci-fi, Randall Garrett and Robert Silverberg. Silverberg himself contributes an excellent and nostalgic introduction. I really enjoyed Sliding Doors, a ten year old movie starring Gwyneth Paltrow and John Hannah. The premise is fascinating: that so much in life depends on mere chance. In the story, everything hinges on whether Paltrow’s character catches a Tube train, or is seconds too late to prevent the train doors sliding shut in her face. Sliding Doors is a romantic comedy, with a sharp script (the writer and director was Peter Howit, whom I remember as Joey Boswell in the Scouse comedy ‘Bread’) and winning performances from Paltrow and the other cast members as two divergent stories are played out in highly watchable fashion. But I found it not just good entertainment, but also rather thought-provoking. But what about crime fiction? It seems to me that the concept would adapt very effectively to our genre. Surely it’s already been done. But I can’t think of a single example – is anyone reading this blog able to come up with any? And there’s more: ‘The crime scene is melting. The murderer has vanished. The body count is on the rise.’ Who could resist such a set-up? Certainly not me. Even the title of the book has a pleasingly traditional feel. And to cap it all, there’s a map of the crime scene! I haven’t read Jim Kelly before, and the first thing to say is that he is a very talented writer. There are lots of good lines and neat similes in this book. His literary style appeals to me a lot. And he is very good at evoking place – the area around King’s Lynn. The challenge he has set himself is to weld a classic whodunit scenario with a highly contemporary police investigation and an important sub-plot. It’s a very bold and ambitious concept, because of course, the ‘impossible crime’ story works most easily when it is far removed from the cold light of forensic science and painstaking police procedure. I was impressed by the novel, although I felt slightly overwhelmed by the number of characters and the convolutions of the plot. Reading the book in short segments, due to pressure of work, I did find myself losing track at times, which was a pity. A cast list would have been very useful, as well as a further nod to the traditional whodunit. However, in the latter stages of the book the momentum was regained, and the disparate story-lines were pulled together rather cleverly. I shall certainly be reading more Jim Kelly. It has seemed like a long, bleak winter. Dodgy weather and constant gloom about the economy, wherever you look. But now spring is officially here, and we’ve seen a few days of sunshine. So things start to seem better. What is more, I’m feeling more confident about my current book-in-progress, The Serpent Pool, having belatedly made a couple of breakthroughs in the structuring of it. At last I feel really excited about it – something that, thankfully, often happens as I approach the later stages of the first draft. This puts me in good heart for the all-important process of revision. And yesterday, I attended my first book fair of the year. This was at the Old Showground in Harrogate. It was great to meet up with a few book-selling friends. I was on my best behaviour too, only buying a single book, about which more another day. I did, however, pick up some book-selling lore, which fits in nicely with my novel - in which Marc Amos, Hannah Scarlett's bloke, and a bookseller himself, plays an important part. Later, my doughty webmaster Jonathan and I wandered around the very appealing town in the sun. And I took these photos to remind me of a day when the tedious bits of winter seemed no more than a memory. This week I had two associated treats. The first was the arrival of an advance copy of the latest Dalziel and Pascoe novel, by Reginald Hill. It is called Midnight Fugue – good title, I think. Publication is scheduled for 1 June. The second was a conversation with Reg himself. I haven’t seen him for a couple of years and it was good to have the chance to catch up over a drink. Twenty years ago, he was one of the first members of the Crime Writers’ Association I met when I joined the newly formed Northern Chapter. It was a very exciting experience for me, as a lifelong crime fan – not least because at the time I was reading his latest book. Reg and his wife Pat, and I and my wife-to-be Helena attended the inaugural meeting at Boroughbridge – Reg christened us ‘The Few’, but the Chapter has gone from strength to strength over the years and Reg and Pat have become good friends. He has given me a great deal of encouragement in my writing career, and was continuing to do so the other night. A few years ago, I published a collection of short stories, and Reg contributed a very generous introduction. For my part, I’ve long been an admirer of Reg’s writing – especially the Dalziel and Pascoe books, of course, but also many others. In fact, he’s had a remarkably varied, as well as prolific, writing career. His thriller The Only Game, for instance, originally written as by Patrick Ruell, is quite splendid. Of the many highlights in the Dalziel series, I’m tempted to pick Dialogues of the Dead as my absolute favourite. I’m looking forward to Midnight Fugue, and so will the rest of his fans. Patti Abbott’s Forgotten Books series is up and running after a one-week break, and my latest entry is Sunspot, a 1981 thriller by Desmond Lowden. I’ve never read anything else by Lowden, and I don’t know much about him except that he was primarily known as a screenwriter, and his most popular novel appears to be Bellman & True. I picked this book up one lunchtime in a Liverpool bookshop (the premises were, sadly, later turned into a building society office) near my workplace, around 25 years ago. The synopsis on the back cover appealed to me, as did the fact that it’s a pretty slim volume – tempting, when time is short. And I certainly wasn’t disappointed by the book. It’s a serial killer story, set in a West Country seaside resort. I have a lifelong liking for the seaside, and so I have an instinctive prejudice in favour of books set in resorts, whether or not out of season. This one benefits from Lowden’s application to the novel of screenwriting techniques. The scenes, and the chapters, are short and very snappy. I was definitely impressed. Yet I never read anything else by this author. I suspect that, for Desmond Lowden, novels were just a side-line to his other writing activities. A quick internet search suggests that he hasn’t published a crime novel since his eighth appeared in 1990. But the man could write, and Sunspot sticks in my mind as a skilful example of the building of suspense. Skyhorse Publishing have sent me a copy of a new anthology edited by Martin H. Greenberg, Jon L. Lellenberg and Daniel Stashower which brings together sixteen brand new short stories from a wide range of contributors. The unifying theme is evident from the title, Sherlock Holmes in America. There is a continuing demand for Sherlockian pastiches, and I’ve been responsible for several myself over the years. I very much enjoy trying to capture Watson’s voice, and the Conan Doyle style, and it’s apparent that the contributors to this volume had quite a bit of fun too. Pleasingly, the contributor list includes a mix of well-known names and those who are less familiar. I was pleased to see a story from Gillian Linscott, creator of the suffragette sleuth. I’ve not seen Gill for a few years, but back at the Nottingham Bouchercon in the mid-90s, Gill and I, together with Stephen Murray (whose forgotten book I discussed recently) performed a dramatic version of the history of the detective story at the city’s main theatre. For me, an enjoyable and memorable experience, given that I am definitely not one of life’s great performing artists. Back to the book. There’s a nice story by Bill Crider – known not only as a prolific author, but also a top blogger – and a contribution from a writer I’ve long admired, Loren D. Estleman. I haven’t read all the stories yet, but already I’d say that this is a collection that will appeal strongly to fellow lovers of the Sherlockian pastiche. My American publishers, Poisoned Pen Press, have produced a chunky volume which anyone interested in the history of crime fiction, and the great achievements of the genre, is likely to find indispensable. It is The Essential Mystery Lists, compiled and edited by Roger M. Sobin. For the first time in one place, Mr Sobin has put together a list of nominees and awrd winners of ‘virtually every mystery award ever presented’, together with numerous ‘best of’ lists by more than 50 prominent contributors to the genre. There are two inevitable features of a reference work such as this. First, it is out of date as soon as it hits the shelves. Second, there are bound to be errors and omissions. I’ve spotted one or two of the latter, but I must add that my strong impression is that Roger Sobin has done a very good job here. He has been most industrious, and has also been wise enough to enlist the help of some of the most knowledgeable people in the crime fiction world – Marv Lachman, Francis M. Nevins and our own Geoff Bradley, tireless editor of CADS. The result is a book that I am sure to keep consulting. I only hope that it will be updated in due course. Such a labour of love certainly deserves to be kept going. One of the movies I most enjoyed in 2008 was Fracture, a splendidly clever new take on the ‘impossible crime’ concept, directed by Gregory Hoblit, so I jumped at the chance to see his latest, Untraceable. Again, it’s a movie with merit – the production values are high, and the action moves at a rapid pace - but overall, it is not in the same league as Fracture. One reason is the casting. Anthony Hopkins was brilliant in Fracture. The actors in Untraceable are more than competent – notably Diane Lane, as a lone mother FBI agent – but somehow seem to lack true star quality. More important, though, is the fact that although there are some intelligent aspects to the film, ultimately it has a slightly exploitative, and at the same time predictable, feel. In essence,.the idea is that a serial killer based in Portland, USA, is murdering people in slow and agonising ways and streaming their torture on to an internet site. The more people who view, the quicker the victim dies. There is some interesting stuff here, around the voyeuristic nature of the viewers, and their often unpleasant (but, unfortunately, not implausible) comments on what they are seeing. The trouble is that balancing this against a clock-race thriller, the film’s audience is in danger of joining up with the voyeurs. Making an internet-related movie work isn’t that easy, although this is an improvement on some efforts I’ve seen. But although it has gripping moments, it does not avoid the trap of cliché. A BBC film critic put it well, when she said that Untraceable, ‘feels as if it’s been patched together using “auto-fill screenwriting software’. And there are plot holes. Why did Lane put herself in a situation where she was vulnerable to the psycho-killer? How did the bad guy organise the set-up for his final crime? I don’t know the answers to these questions, and I’m not convinced Mr Hoblit did, either. The case of Graham Young is one of the most interesting murder-by-poisoning stories of the 20th century, and I’ve just watched the film based on Anthony Holden’s account of the case, The Young Poisoner’s Handbook. Young discovered the efficiency of thallium as a means of committing murder whilst a teenager. He poisoned several people, including – fatally - his step-mother. Sent to Broadmoor, he was treated with some care and sympathy and ultimately released into the community – he was regarded as fully recovered. Thereafter, he found a job in a photographic supply business, but started to poison his colleagues. For weeks it was thought that the company had been afflicted by some mysterious ‘bug’, which resulted in two men suffering quite agonising deaths. It was only when Young started asking too many questions which revealed his obsessive fascination with poison that his background was checked and he was arrested. Surprisingly, he pleaded not guilty, but he went back to Broadmoor, where he died – allegedly of a heart attack, although there is some debate as to whether he was killed by fellow prisoners, or committed suicide; the film opts for the suicide version of events. Graham Young was one of the most remarkable poisoners in the history of crime. It is said that his hero was Dr Crippen. However, it’s worth remembering that if Crippen did murder his wife (which is open to question), he did it quickly, and the crime was a one-off. There is something remarkably cruel, to my mind, about the way Young allowed his victims to endure such horrific suffering. And it’s a level of cruelty that the film, although entertaining, does not begin to explain. Last year I was one of the writers who participated in the Readers’ Dinner, and the Festival as a whole was thoroughly enjoyable. There were a number of real highlights – including meeting that wonderful writer Thomas H. Cook, learning about the Detectiion Club over lunch with Aline Templeton, and taking part in a quiz team with a group of very agreeable companions. It was great fun, as always, to catch up with a number of old friends. Finally, I must mention my delight in the fact that my Murder Squad colleague Ann Cleeves - who was the person who first urged me to get involved with Harrogate, where she has been Reader in Residence for several years - has just announced that her Jimmy Perez books set in Shetland are to be televised. This follows hard on the heels of a deal to televise her series featuring Vera Stanhope. Blimey! At this rate, there will be a dedicated AC TV channel within months. Can’t wait! For the first time in ages, I’ve watched an old episode of Columbo. ‘Murder, Smoke and Shadows’ involves a young film director, played by Fisher Stevens, with a gift for special effects, whose past catches up with him. A few years earlier, he and a friend were filming when the sister of another friend was killed in a motor bike accident. The Stevens character failed to save her, and now the sister’s brother has learned the truth, and is bent on exposing his betrayal. The brother is naïve enough to show his hand, and meets a grisly fate, electrocuted on a deserted film set. The director, naturally, persuades himself that he has committed the perfect crime. Needless to say, he hasn’t reckoned on Lieutenant Columbo’s determination and detective genius. Bit by bit, Columbo sees through the evasions and pieces together the clues. The film-making background affords the opportunity for some clever and dramatic scenes before the killer is finally brought to book. Columbo is formulaic in the extreme, but is so well done that I still found this episode very enjoyable, almost twenty years after it was made. Peter Falk is superb as the shabby detective and well served by ingenious and occasionally witty scripts. I think Columbo is (like, in a very different way, the Father Brown stories) best taken in small doses. But well worth taking, every now and then. Patti Abbott's series of Friday's Forgotten Books is taking an official break today, but I thought I'd cover an obscure title anyway, and I've chosen Milward Kennedy's Sic Transit Gloria. Kennedy was a significant figure in the Golden Age, a crime fiction reviewer as well as a novelist, and a prominent member of the Detection Club. However, his books are nowadays forgotten by all except a few. Anthony Berkeley’s preface to The Second Shot is often quoted for its emphasis on the importance of the psychology of crime and I hoped this book might be equally notable. But I have to say that Kennedy was not quite in Anthony Berkeley's league, lacking both the master’s gift for elaborate plotting and also his sardonic wit, although the finale to the story has a touch of irony of which Berkeley would have approved. After a promising start, the story drags before warming up in its latter stages. James Southern discovers the body of glamorous Gloria Day in his London flat: did she kill herself, or was she murdered? He determines to find out the explanation for her fate and ends up playing ‘the part of justice…A jury could only have secured injustice. What did the law matter – if the law could not have secured justice? People talked of judicial murder: was not judicial failure to secure the just punishment of a murderer just as bad?’ Of course, the answer to the question is not so simple. The novel was published in 1936, and perhaps its most interesting feature is the light it casts on the political scene in the years leading up to the Second World War – Southern reflects, for instance, on the morality of murder for political purposes. Kennedy’s experiment is smoothly written and worth reading. It's not a masterpiece, but certainly of interest to anyone intrigued by the 30s and the history of detective fiction. Mention of Andrew Garve and Cyril Hare naturally leads me to a subject of great personal interest – crime writers who combine their fiction with a day job. To illustrate my other life, you may be amused to read my legal reminiscences as an employment tribunal advocate on the BBC website, or even to watch my less than George Clooney like performance when they filmed me the other week. Or you may conclude you’d rather not know! At the CWA Daggers Dinner last year, I had the pleasure of meeting, and sitting next to, Elizabeth Corley, a successful businesswoman. Janet Neel shuttles between high finance and crime writing. Michelle Spring is an academic, and so is Christine Poulson. For as long as one can juggle two careers, it’s a fascinating thing to do. Andrew Garve was one of the pen-names used by a left-leaning journalist called Paul Winterton. His early publications included A Student in Russia and Eye-Witness on the Soviet War-front, but he became one of the most reliable purveyors of mysteries and thrillers in the immediate post-war era. A founder member of the CWA, he was also its first secretary, holding the office jointly with Elizabeth Ferrars. He also used the pseudonyms of Roger Bax and, later, Paul Somers. But Garve is the name associated with his most successful work. This includes the first Garve book I ever read (because his friend, that great judge Julian Symons, rated it highly), The Megstone Plot. This story, with a nice fake-blackmail plan, was filmed as A Touch of Larceny, a movie that crops up on television from time to time, although I have never managed to see it. In 1997, I was commissioned by Chivers to write an introduction for their reissue of Prisoner’s Friend, a lively if straightforward thriller Garve wrote 35 years earlier, in their excellent Black Dagger series. It was no masterpiece, but still a book that exemplified Garve’s competence as a story-teller. When I attended the Las Vegas Bouchercon, a few years back, someone on a panel concerning the collecting of crime fiction suggested that Garve would become increasingly collectible in years to come. As far as I can tell from internet book prices, this has yet to happen. But Garve, who died in 2001 but gave up writing long before then, was a capable practitioner and I’ve bought a few more of his paperbacks to check him out in more detail. A.A. Milne is remembered today as the creator of that amiable character Winnie-the Pooh, but he was also fascinated by the detective story. More than that, he ventured into the genre on several occasions, with short stories (including one I think is quite splendid), one or two plays and a novel that many regard as a light-hearted classic of the Golden Age – The Red House Mystery. The book was first published in 1922, just after Agatha Christie and Dorothy L. Sayers first came on to the scene. Thirty year old Antony Gillingham is the amateur sleuth in this enjoyable tale, which I was commissioned to review by Tangled Web UK (one of my favourite online crime fiction resources, by the way) to mark the appearance of a reprint by Vintage Books. The Vintage edition is pleasingly packaged and includes a short and cheerful introduction by Milne, who takes the opportunity to chat about some of his ideas about the genre – including his preference for an amateur sleuth, definitely not quite so fashionable these days. Milne, incidentally, was an early member of the Detection Club. I’m delighted by this reprint. Vintage are to be congratulated. I do hope they can be tempted to reissue more hidden gems of the detective genre. Barry Forshaw rang to tip me off that he’d talked about my work on the BBC Radio 4 programme ‘Open Book’ yesterday, while warning me that there was always the chance that any mention of my name might be edited out of the final interview! The theme of that part of the programme was lawyers who write crime fiction and the starting point was Mariella Frostrup’s interview of P.D.James about Cyril Hare. I’ve talked about my admiration for Hare on this blog, and James is clearly a huge fan, especially of Tragedy at Law. Barry was then interviewed by Mariella (lucky chap) about lawyers who write crime and gave me a name check, along with Frances Fyfield, when talking about British lawyer-writers. The Americans, he mentioned were Scott Turow, John Grisham and Mark Gimenez, so I felt I was in very select company. By coincidence, Steve Steinbock has just blogged about my very first novel, All the Lonely People, which introduced the Liverpool lawyer Harry Devlin, on Criminal Brief. Steve recently gave my latest novel with a legal background, Waterloo Sunset, a terrific review in The Strand Magazine, and this time I am quite unable to resist linking to his generous remarks. Finally, three more entries on the blogroll: Bookwitch, Paul Brazill, and Deighton Dossier. Do also check out Rob Mallows’ impressive website about Len Deighton. I rather enjoyed The Two Mrs Carrolls, a movie that is often described as a film noir (though I think you need to define film noir quite loosely to accommodate it.) Really, it is as much a classic woman in jeopardy story as the very different Back to the Coast which I discussed the other day. Unexpectedly, the woman in jeopardy is Barbara Stanwyck, often a femme fatale, but here a rather syrupy character who makes the mistake of falling for psychopathic artist Humphrey Bogart. Bogart too is cast against type – he’s not really ideal for the role of angst-ridden creative genius, and the headaches which represent his troubled mental state are portrayed (to be blunt) in an overplayed manner of which any ham actor would be proud. Yet somehow, despite the flaws of the film – it’s based on a stage play, and the theatrical origins of the story become increasingly apparent as the story progresses – it is still pretty entertaining to watch. Bogart falls for Stanwyck while still married to the first Mrs Carroll. He paints his wife as the Angel of Death, and then, as his creative juices begin to dry up, decides to murder her. For a time, he is happy with Stanwyck, but then the problem returns and he allows himself to be seduced by Alexis Smith (rather less attractive than Stanywyck, but there’s no accounting for tastes.) He embarks on another murder plot, but his schemes are complicated by a blackmailing chemist and his own precocious daughter. Very watchable. Swedish television adapted Henning Mankell’s Kurt Wallander books for the small screen before the BBC got there with the recent series starring Kenneth Branagh. Thanks to Roger Cornwell of Cornwell Internet, I’ve just watched one of the shows, Before The Frost. I haven’t read the book which sourced the tv programme, but I did find it enjoyable viewing. The actor who plays Wallander, Krister Henriksson, is less obviously charismatic than Branagh, but I liked his rather shambolic interpretation. The story features the cop’s daughter, Linda, who joins her father’s police force only to become personally involved in a bizarre mystery with origins in a horrific real-life event. Like a number of other Mankells, this one opens with a vivid, horrific and baffling scene – an attack on swans. This is witnessed by an elderly woman who is out mapping abandoned pathways through the woodland. She suffers an accident and is incapacitated, making her easy prey for the villain of the piece. When her daughter reports her missing, Wallander comes on to the scene. It’s a dark story, but compelling, and as usual insight is offered into a particular aspect of society of which Mankell disapproves – to say more would be giving too much away. I’m glad to have seen it – thanks, Roger. It seems heretical to suggest that a book by Len Deighton might be 'forgotten' so as to qualify for inclusion in Patti Abbott's series. But I think Close Up does qualify, and given that Deighton has just celebrated his 80th birthday, it seems timely to remember this foray into the movie world. I covered the book as my contribution to an extensive Deighton appreciation for Shots, that excellent online magazine, and I thought I'd include in a blog post a few of my thoughts about it. Inevitably, Deighton will always be associated with the spy novel. I have long been a fan of books like Bilion Dollar Brain and Horse Under Water. There was one nice little trick connected in a way with the concealment of identity in Billion Dollar Brain which I was cheeky enough to adapt and then utilise in a very different book of my own - I Remember You.The Ipcress File made an especially good film, benefiting from a soundtrack by the brilliant John Barry that includes the spooky main theme, often heard today as background for all kinds of television programmes. But there is much more to Deighton than Harry Palmer (the name given to his central character when the books were filmed). To my mind, some of other work is equally appealing. I’m definitely not qualified to judge his cookery books, or his travel guides, but I enjoyed Only When I Larf, which is quirky and unusual. Close-Up is even better. Close-Up was published in 1972, and I read it a couple of years later. I haven't read it from cover to cover since then, but still it sticks in the memory. It’s set in the film world and presents the story of a fading star called Marshall Stone. Deighton spent some time working in the movie business, and he put his experience of the business to good use. I met Len Deighton once, about fifteen years ago, when he was over in Britain (he spends most of his time in the States.) He struck me as modest and unassuming. It was one of those conversations that lasts only a few minutes, and which one wishes had gone on much longer. Had it done so, I would have mentioned how much I enjoyed not only his celebrated novels, but also Close Up. I recently added a number of blogs to the blogroll. They include Dorte’s excellent blog – if you haven’t read her post on the rules of feminist detective fiction, which she mentioned here in recent comments, you may be interested to check them out. Another blog well worth a look is the much-visited blog run by Kate Sutherland. I came across it by chance, via a link from John Baker’s blog. This is one of the things I like about the blogosphere – all the unexpected connections. Wandering from link to link, I sometimes feel like a child entering a vast, sometimes unfamiliar and daunting, yet nevertheless utterly entrancing world. A third blog that I’ve only recently encountered is that of the East Midlands crime novelist Stephen Booth. Over the years, I’ve done one or two events with Stephen, and the highlight was when we were both in the short-list of six for the Theakston’s Old Peculier Prize for best crime novel of the year, at Harrogate in 2006 (The Coffin Trail was the book of mine that got me there.) Also on the short-list were Susan Hill, Lindsey Ashford, Ian Rankin and the eventual winner, Val McDermid. The last time I saw Stephen was one evening in autumn when we had a drink together in the bar of the Bouchercon hotel in Baltimore. He’s a journalist whose sales success enabled him to become a full-time novelist. I first came across Stephen through his well regarded debut novel Black Dog and I’ve read several since then. My favourite is The Dead Place, a really excellent mystery that handles the death motif very well. I once told him that, after that book, I felt I couldn’t go ahead with a planned Lake District novel I had in mind, called The Dead Shop (after the old morgue in Appleby). And at that point, he told me he’d once contemplated a book involving a coffin trail….. Finally, I want to mention my sadness at the passing of a notable member of the crime community, Barbara Franchi. I had the pleasure of meeting her, though all too briefly. She reviewed one or two of my books very positively, and since she was by no means a bland reviewer, I was definitely in her debt. Many others who knew her much better than me have paid warm tributes to her on the internet and elsewhere, making it clear that she will be much missed. Peter Antony’s short, snappy story in The London Mystery Magazine, 'Before and After', which I mentioned recently, is (as far as I know) the only short mystery to appear under that name, featuring the notable amateur sleuth Mr Verity. The short story in LMM, is an impossible crime tale, a neat little snippet, and I am glad to have discovered it after much searching. Anthony went on to write the screenplay for Hitchcock’s Frenzy, as well as Sleuth, the rather less successful Murderer, and that horror classic The Wicker Man. He died in 2001, shortly after publishing his memoirs. Peter wrote a number of outstanding stage plays, perhaps most famously Equus and Amadeus. He was eventually knighted and survives his twin. I wonder if he ever looks back fondly on his early excursions into detective fiction. I hope so. Saskia Noort is an interesting Dutch writer, described by her UK publishers Bitter Lemon Press as ‘a bestselling author of literary thrillers’. I rather liked the first Noort book they published, The Dinner Club, and so I fell upon her new book, Back to the Coast, with considerable enthusiasm. In fact, as is the confusing way with the publishing of books from overseas, Back to the Coast was Noort’s debut novel, originally appearing in Holland in 2003. The English translation is by Laura Vroonem. I’m never quite sure why the work is so often published out of sequence – it’s even more puzzling in the case of a mystery series. At least the two Noort books are stand-alones. The story is told by Maria, a singer with two children and a history of unsatisfactory relationships. At the start of the book, she has an abortion, and soon someone starts to persecute her because of it. Threatening messages are followed by an arson attack on her house. The police are lackadaisical, and soon an increasingly paranoid Maria flees to the coast, to stay with her sister Ans. But there is no hiding place for her. Soon her unhappy past starts to catch up with her. Strip it down, and this novel fits within the tradition of the woman-in-jeopardy novel. Noort is a trendy writer, but I’m not sure I’d call her books ‘literary thrillers’ – really, she is updating the work of Mary Roberts Rinehart, Ethel Lina White and Mary Higgins Clark. But this is not a criticism. I find her books quirky and intriguing. Here, I guessed the identity of Maria’s persecutor, and the motive, early on. But strangely, this did not spoil my pleasure in a story told in an off-beat way by an appealing and vulnerable narrator. Yet another good book from Bitter Lemon. Hitch was seen explaining that he only ever filmed one ‘whodunit’, because he didn’t find it satisfactory to have his audiences concentratiing on the solution to a puzzle, rather than on emotional engagement with the characters. I think he had in mind some of the highly cerebral detective stories of the Golden Age (step forward Ronald Knox?) but I’d take issue with the suggestion that all whodunits of the past, let alone the present, lack an emotional pull. However, there’s no doubt that the key to Hitchcock’s genius is his ability to involve viewer in the build-up of suspense. So often we know something that the protagonist does not. I was interested by his statement that he erred in Sabotage (one of the movies I haven’t seen) by having the bomb actually go off and kill someone, rather than being discovered in the nick of time. Among the other films mentioned was Young and Innocent – I own an omnibus DVD which includes this one, but have never got round to watching it, perhaps because the title put me off. I ought to give it a chance. Hitch’s use of dramatic settings for climatic scenes was emphasised, as was his range of camera tricks and techniques. I learned that many of his early ‘talkies’ were based on stage plays, until his career took a leap forward with the first version of The Man Who Knew Too Much. Among the movies that this programme has encouraged me to seek out is his first ‘talkie’, Blackmail. And the witty script made it good viewing for its own sake. Ronald Knox, about whom I posted the other day, was a keen Sherlockian, and an intellectual student of the genre. He was involved with the Detection Club right from the outset, and was among the contributors to Club publications such as Behind the Screen and The Floating Admiral. He is, however, probably best remembered by mystery fans today for his ‘Decalogue of Detective Fiction’, which began life as a lecture and later formed the preface for a volume of short mystery stories which he edited in 1928. He argued that the detective story is a tale told back to front, with the body appearing early in the story and the detective trying to establish the facts which led to the murder. He argues that the formality of the true detective story (as opposed to the thriller, which depends for effect on shock value) required a set of governing rules and he set out his own idea of the ten commandments of the genre. The first commandment, for instance, is that the ‘criminal must be someone mentioned in the early part of the story, but must not be anyone whose thoughts the reader has been allowed to follow’. Even today, this concept seems to me to have some merit in relation to the whodunit, but like all rules it can be broken to great effect by writers of talent. Some of the other commandments (‘not more than one secret room or passage is allowable’) are a touch facetious while ‘the detective himself must not commit the crime’ is a rule which, if rigidly enforced, would have deprived us of a number of classic crime novels. So Knox’s commandments are fun, and a historic curiosity, but not much more than that. However, I can’t help wondering - do readers of this blog have any commandments of their own for modern day writers? If so, let me know!